Origin Commonwealth Aircraft Corporation, Australia. Weights Empty 5,450ib (2474kg); loaded 7,600lb (3450kg). Performance Maximum speed 296mph (474km/h); service ceiling 29,000ft (8845m); range at 190mph (304km/h) 930 miles (1490km). Armament Two 20mm Hispano cannon and four 0.303in Browning machine guns. History First flight 29 May 1942; first delivery August 1942; final deliveries early 1944. 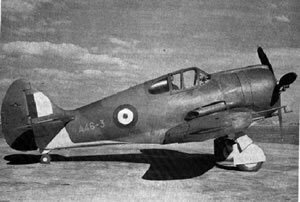 The only all Australian aircraft to see combat during the second world war, the Boomerang was designed and built in a very short time under the threat of imminant Japanese invasion. 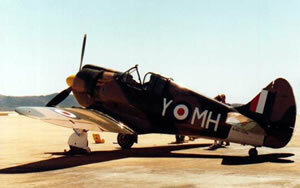 The Boomerang design was based on the Commonwealth Wirraway a general purpose aircraft already in production by the company. 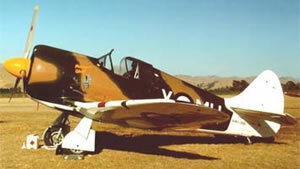 Lawrence Wackett, head designer at Commonwealth, decided to exploit the companys Wirraway licence which allowed modifications to be made to the aircraft. 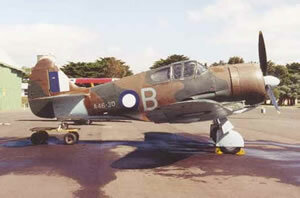 The fighter was based on the North American NA-33 on which the Wirraway was also based. 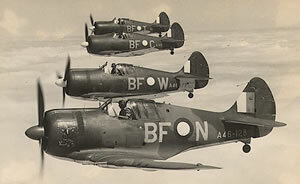 Although only a stop gap fighter, the boomerang fulfilled an important role in the Pacific theatre, making up in ruggedness, manuverability and climb what it lacked in speed and range.The CA-12 owed its shape to the heavy and powerful Twin Wasp engine, which was installed in an airfrme for which it was not designed.Desepite this the boomerang was easily to hadle and highly manourable and the prototype proved a success in flight testing. An initial order for 105 CA-12's was placed in February 1942. These were followed by 95 CA-13's and 49 CA-19's before production ceased in January 1945, the later types differing in minor details only. The first encounter with enemy aircraft took place on My 16, when two Boomerangs successfully intercepted three Mitsubishi G4Ms. 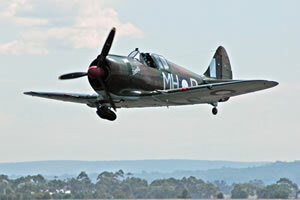 As more advanced aircrfraft arived form the US and Britain the Boomerangs were no longer required as intercepters and reassigned to support roles flying intially along side Wirraways and later replacing them in more demanding roles. It was as a fighter bomber that the Boomerangswere most successful.